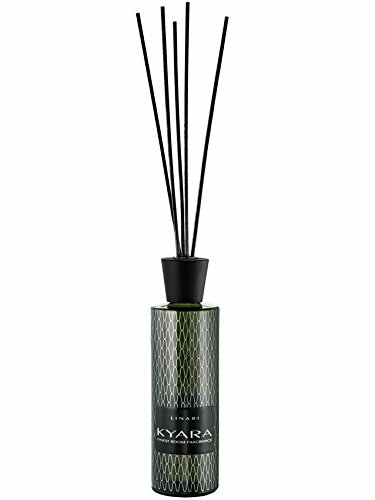 LINARI KYARA - Complexity and Relaxation - A radiant creation of red berries, sweet fennel and Calabrian bergamot that is perfectly balanced by a complex balsamic-sweet bouquet of aromatic guaiac resin, nutmeg, enchanting stephanotis and subtle woody amyris. The sensual base is dominated by woody-spicy notes of amber, labdanum, cedar wood, gurjun balm and earthy patchouli that is accompanied by a powdery-sweet note of musk. The four new WAVE LINE room fragrances from LINARI have been created exclusively by some of the world's top perfumers. The diffuser flacons are the ultimate eye-catchers, with silver waves enveloping the bottles. The frosted white and antique green bottles play with the matt white and black lids and metallic labels. The result is a collection of perfectly designed objects as well as a series of elite home fragrances.